We are lucky enough to live in a country where we can freely speak our minds and support any political party we wish. Today more so than ever the internet, twitter and social media allows individuals to vocalise their opinion in public not just journalists and politicians. 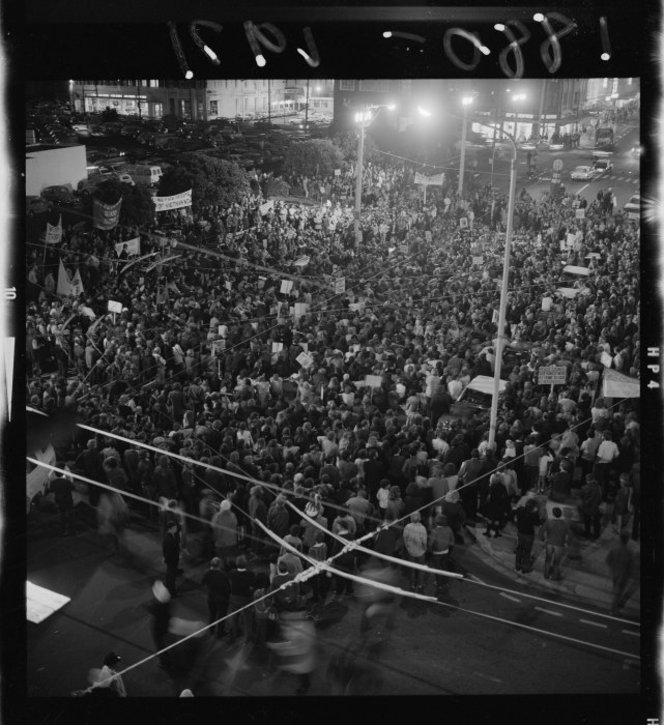 Cuba St has been host to protests from the day of its inception. In 1839 the surveyors off the ship Cuba pegged out the town plan hammering pegs into the vegetable gardens and areas around the Te Aro Pa. Iwi from this Pa had not authorised the sale of their land to the Wellington Company, other Pas in the region had. Men from the Te Aro tribe stealthily slipped out at night and pulled the pegs up out of the ground. They continued this action for some days until finally the Cuba surveyors took up arms and put an end to the protest. In my life time I have marched down Cuba St, one such time being the 1970’s anti Vietnam War protests. I joined my siblings with hundreds of other mostly young people protesting at NZ’s involvement in the war. I vividly remember watching a long haired young man setting fire to the US flag outside the doors of the Town Hall and being arrested for the act. In the 1880s Workers Unions were established in the country, a consequence of a decade that became known as the hungry 80’s. 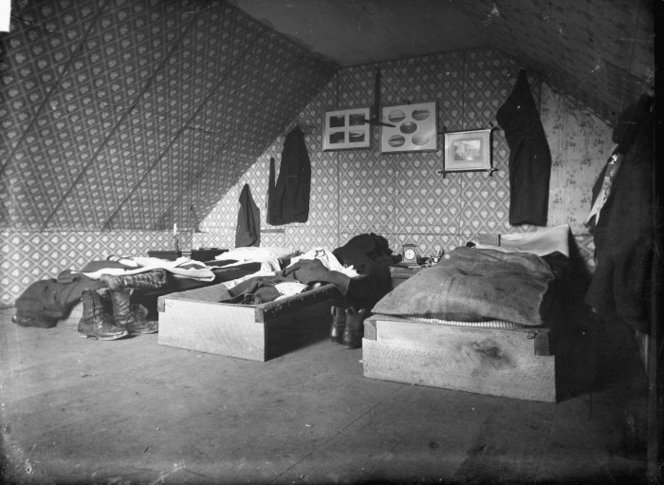 Many of the residents in Te Aro where out of work and the area became overcrowded and slums emerged. Disease was a huge problem, there was serious pollution with open sewers and belching smoke stacks this took its toll on the inhabitants. Typhoid took hold and many deaths occurred around Cuba & Ghuznee St. 1886 was the worst period of that economic downturn and protest marches became a way for the effected community to highlight their plight. These protest marches helped gain support from the wealthier members of the township which eventually lead to social and infrastructure reforms at the turn of that century. 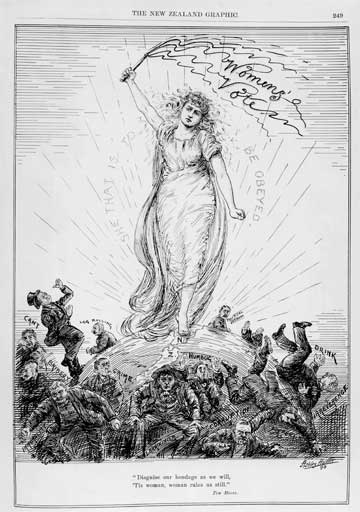 The woman’s suffrage movement was strong in Wellington, with educated woman leading those from the Te Aro area in gaining signatures for the petitions and attending the mass rallies demanding the vote for woman. Men who believed the sky would fall in if woman got the vote circulated anti-suffrage petitions in the local pubs, as women were also campaigning for prohibition. In 1893 the woman triumphed, however there will still residents such as the Chinese who could not vote. Today feminists still meet in Cuba St, I see that they had a gathering and concert at the San Francisco Bath house just last weekend. 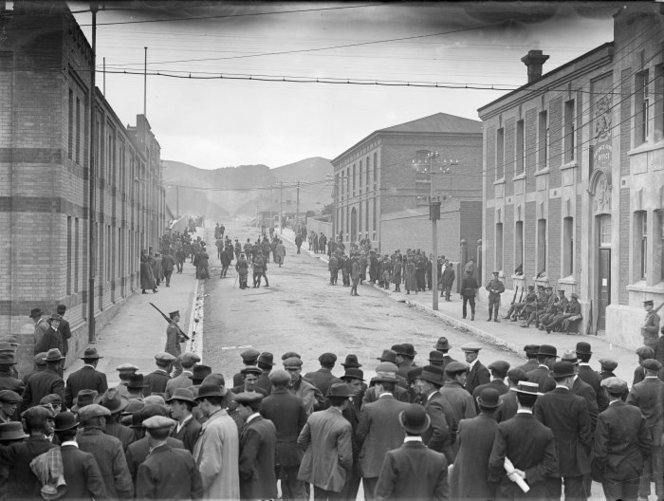 In 1913 the Wellington wharf was busy exporting the golden fleeces grown in the surrounding region; the workers went on strike for increased pay and better working conditions. There were protests at the wharfs. A special military police force would march from their barracks in Buckle St down Cuba St to the wharfs. During this strike there were numerous bloody clashes; such as when disgruntled farmers rode into town on horseback and clashed with the striking workers. 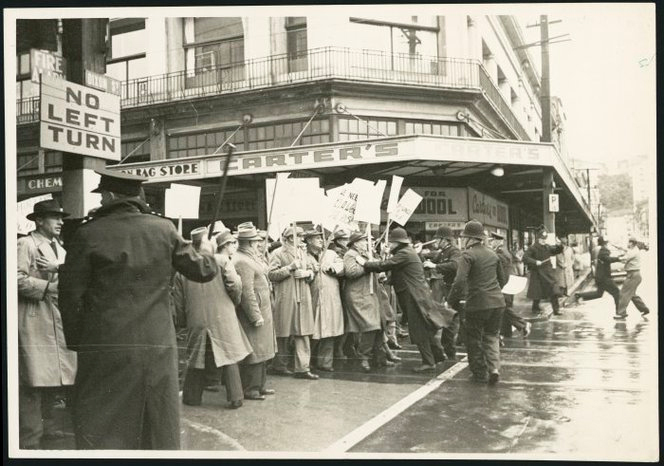 Again in 1951 the wharfies went on strike with protests around the Queens Wharf area as well as marches through Te Aro area including Cuba St. This strike was unsuccessful for the workers it seems the same outcome will occur for the current wharf strikers. The protest movement to stop the bypass at the top od Cuba St was also unsuccessful. However the protest did influence the council so much regarding the artists studios that were demolished the council set up Toi Poneke Arts Center in response. Protest is still alive and well in Cuba St and NZ, but it seems the physical act of protest has moved into cyberspace where it can gain more supporters across the world rather than just from the street. Union march at the intersection of Cuba and Dixon Streets, Wellington, taken 2 May 1951 during the Waterfront Strike by Photo News Ltd. Unionists are met by police officers as they arrive at Dixon Street. Heritage Buildings, are they important? Well I think we had all been expecting it. The Bishop of the Anglican Church yesterday announced that the Christchurch cathedral will not be resurrected on the same site to the same design. It will be too costly and they are not convinced the ground underneath will ever be suitable again. It is heartening that they will deconstruct what is left of the cathedral by hand, carefully extracting the stones, wooden features and stain glass windows that are still intact within the ruin. 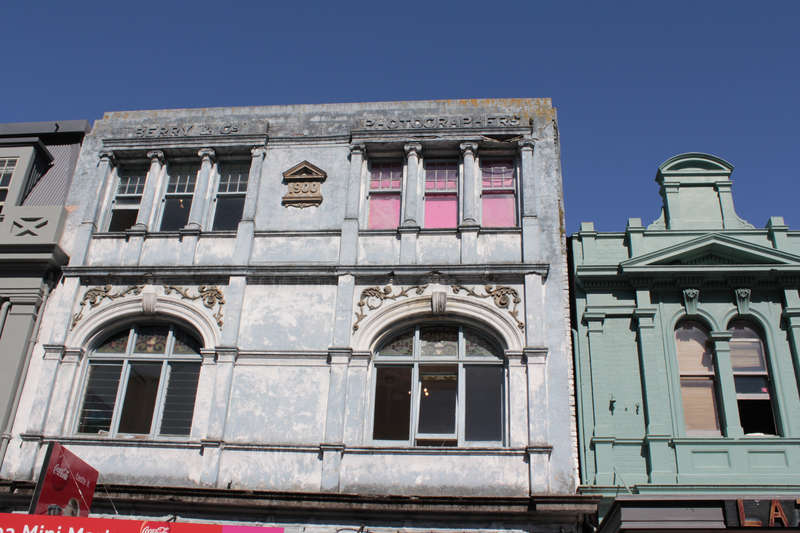 It is unfortunate however that a large number of other heritage buildings that have been demolished in Christchurch recently, have not been so carefully deconstructed, hundreds of architectural features have been lost forever. 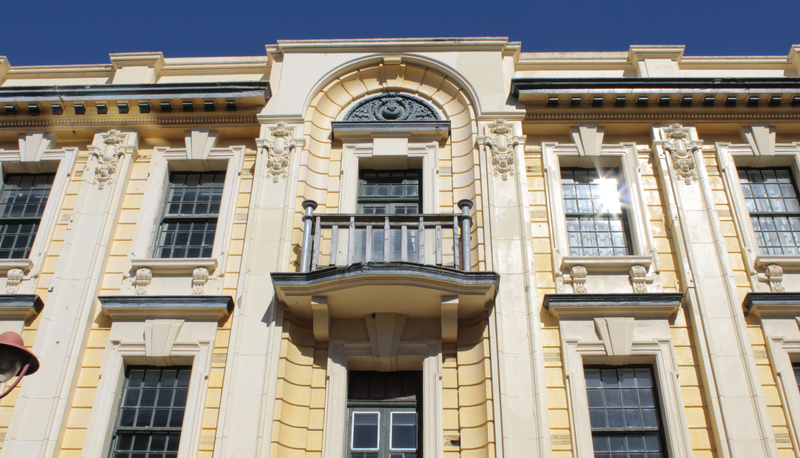 Wellington has hundreds of buildings listed as earthquake prone, including the 42 buildings in Cuba St. 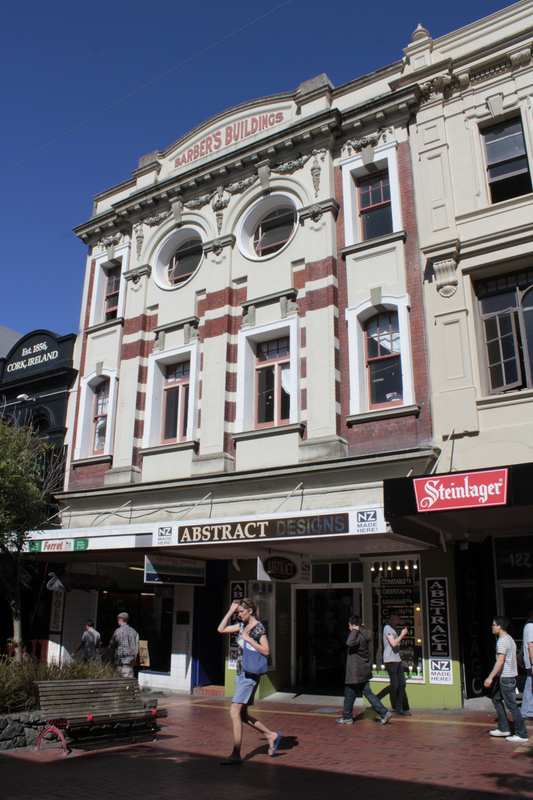 I am not sure how many are heritage listed, but know that Cuba St has 44 buildings on the NZ Historic Places Trust register most are category 2 a few category 1. What protection do these categories give the buildings anyway? The catastrophe of Christchurch has proven that really at the end of the day it is more about the safety of the people than the consideration of bricks and mortar, which I totally agree with. However as a connoisseur of architecture and a believer that our built environment influences us consciously and subconsciously, I am concerned about what will transpire in Wellington over the next few years regarding our built heritage. The Historic Places Trust register does not have any real legal rights over any of the buildings on its list. councils are required to inform the trust when any listed building owner applies for building consent or demolition. The trust can then communicate with the owners and council advising on funding opportunities for conservation or getting some buildings listed on the council’s register. If a building is on the council list they will assist financially in helping to retain the buildings original character. With the council now burdened by its own listed buildings requiring re strengthening, I can’t see there being to many dollars left over to assist other building owners. The council does have a built heritage incentive fund that it allocates to owners annually, however now that the quantity of buildings needing to be upgraded has increased, by the councils own regulatory bar raising, this fund may only strengthen a few bricks in the walls. ‘What happened in Christchurch has changed the public’s perception of risk and placed scrutiny over the current regulatory framework in dealing with human safety and building resilience. An initial assessment of areas of interest for Council’s policy and programme responses includes the following: there are around 435 URMs in Wellington City. 166 of these URMs are heritage listed, the cost to strengthen all URMs to a higher level of New Building Standard (e.g. 67% NBS) equates to about half of their current capital value. Most major routes in and around the CBD have concentrations of earthquake prone and potentially earthquake prone buildings alongside. The economic impact of a Christchurch scale event on Wellington would be in the area of $37 billion. This is based on the quantum of known costs from Christchurch and a potentially greater scale of economic disruption for Wellington due to major infrastructure and network damage. The wider social and economic impacts of a major event on Wellington warrant taking a city resilience approach. This may extend beyond legislative requirements designed primarily to protect human life. Thank goodness the issue is now taking centre stage. Let’s hope there will be some paying audience participation in the script writing process.